I’m about to build an ultimate gaming table. This table will have a built in 40” tv, a built in spot for a Surface Pro to power it, and be wired for LED lighting. I have a few questions, and I’ve included my design for clarification. I’ve also included pictures of my existing table as I’m using that as my inspiration for this new version. Any help you can provide is greatly appreciated! I’m planning on using Mable for the rails, skirt, legs, etc. 1) What plywood should I use to make the actual game surface? 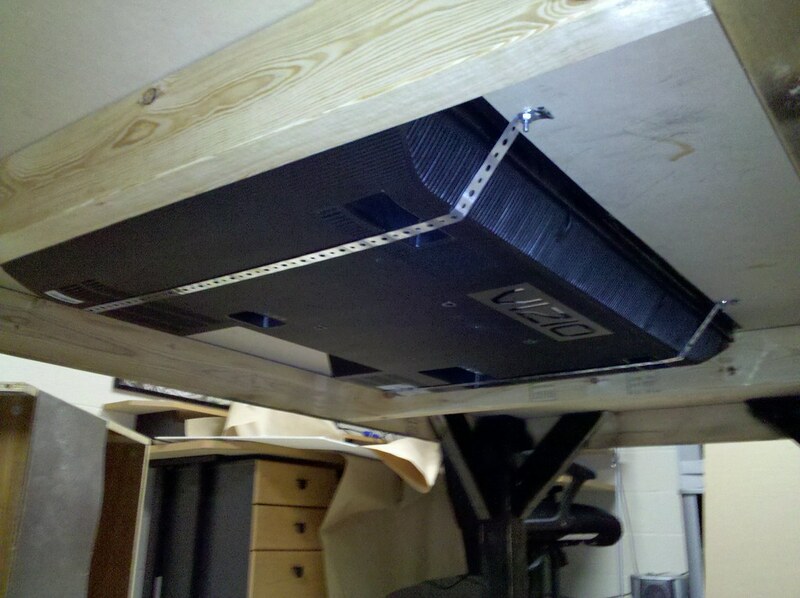 I want to ensure no warping, no sag, and that the TV is properly supported (around 20 lbs tv). The surface is going to be covered with felt, so I’m not concerned about stain/appearance. 4×8 mable plywood is around $95, should I use it for the strength or is there a cheaper alternative that would offer the same support? 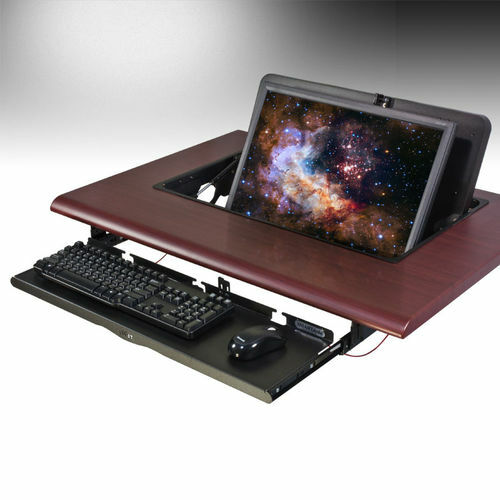 2) I’d like a ‘pouch’ to put the tablet in…have it recess into the table like 4” or so. I want it at about a 45degree angle so you can set it in there and still see what’s on (both on the tablet and the table). I’m not sure what angle I’ll need or how best to build it out. 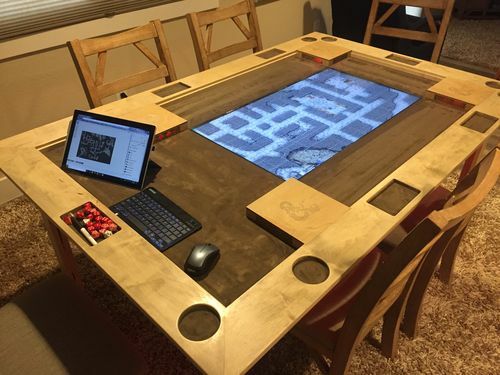 I can’t seem to find anything online about it and I’m not sure if there is a special name for this feature or what term I should use for googling it… Think of it as a slight wedge cutout so the screen doesn’t obstruct your vision of the table too much while still being functional to interact with. 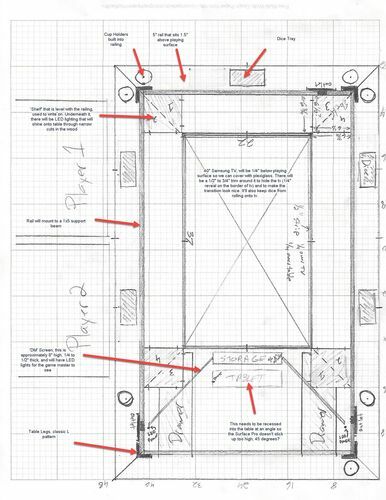 Any idea what this is called and where I can find out how to measure the angle properly and build it? I attached a picture which is a poor representation of this as I’m not looking for a secret compartment or anything that folds, I’m just looking for a perm insert like depicted. 3) I need to build dice trays into the railing, is it best to router these out (i.e. router down 1/2 inch) or simply cut all the way through and attach a 1/4 piece of wood to the bottom. My concern is aesthetics. I’d like this to look nice and I’m not sure what it would look like to have 1/4” piece of wood attached to bottom of the rail. Perhaps it’s no big deal, but wanted to get opinions. The bottom of the tray will be felt. 4) Supports. 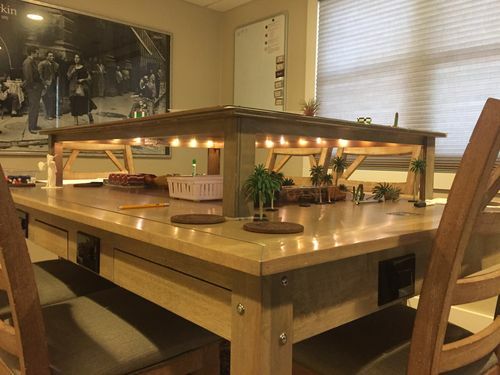 Right now, I have a similar table, it’s 6’x4’ and made of maple. The only supports it has is a 1×5 skirt/frame running 1 3/8” in from the edge. There are no cross supports under it and it seems to be just fine 1 year later (no warping, sag, etc). Adding in the tv changes the weight of the table some, do I need to add additional support than what is already there? 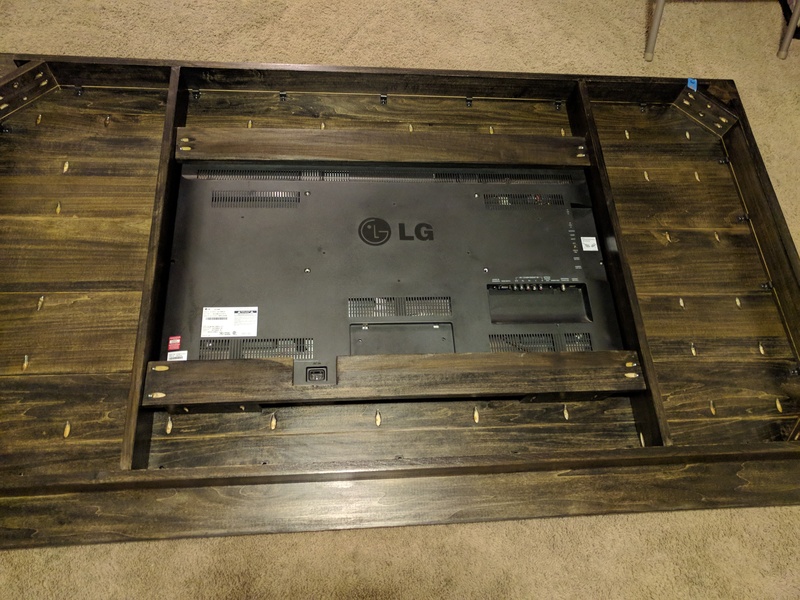 I’m planning on boxing out the tv underneath using 1×3 or 1×4 (tv is only 2.6” thick), that way the tv an rest in it…Should I run additional mini supports from the box out to the frame or should I go frame to frame and put a whole 1×4 horizontally across the underside in several locations? Is that overkill? 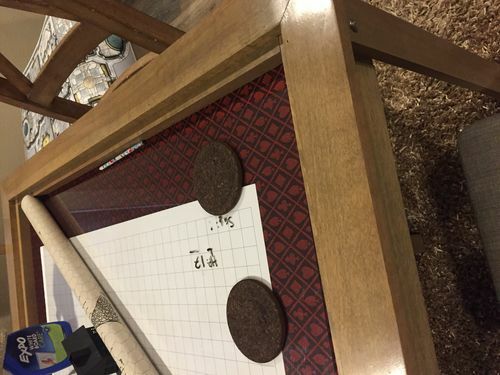 I’ve also attached 2 images of my current table to demonstrate how the playing surface is below the railing and to show how it’s currently supported.